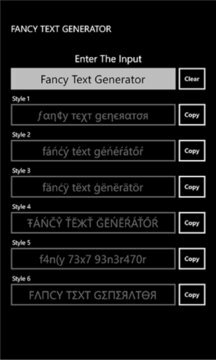 Fancy Text Generator allows you to create cool, funky and stylish text for Facebook, WhatsApp and Twitter. You can use Fancy Text Generator to create lots of different styles of text which can be later used in Facebook / WhatsApp statuses and also for tweets on Twitter. It is very quick and simple to generate text - enter your text in the text field and the rest is taken care by Fancy Text Generator. It displays a plethora of options in different font styles which can be copied to the clipboard and used wherever required. As you enter the text, the different fields in the results area under the Fancy Text Generator will automatically update with each showing your text in a unique and fancy text style. The use of this is not just limited to Facebook, Twitter or WhatsApp. Your imagination is the key to creativity here. The generated text can also be used in Instagram, SMS, Contacts, Notes and so on. The list is endless. Using this fancy text styles in Facebook & Twitter is probably one of the most popular uses of the Fancy Text Generator, but using these cool letters and fancy writings isn't simply limited to nicknames on MSN and Live messenger, you can place the fancy writing text in your online profiles, use them in conversations, forums and even for status messages on Yahoo Messenger! and Facebook.